Fat Gay Vegan is thrilled to bring London TWO incredible vegan market destinations each and every weekend. First up, Fat Gay Vegan at Venn Street is your south London community market. Taking over one-third of the iconic Venn Street Market, this collection of vegan traders will have you coming back every Saturday. Entry is free. Click here to see Fat Gay Vegan at Venn Street location thanks to Google Maps. Nearest Underground station is Clapham Common, located just a one minute walk from the market. Regular traders include Temple of Seitan, The London Feel Good Co, Red Tent Ethiopian, Let’s Do Temaki, Super Indian, Jump to the Beet, Self Care Co, Horia Vegan, and Nutkin. 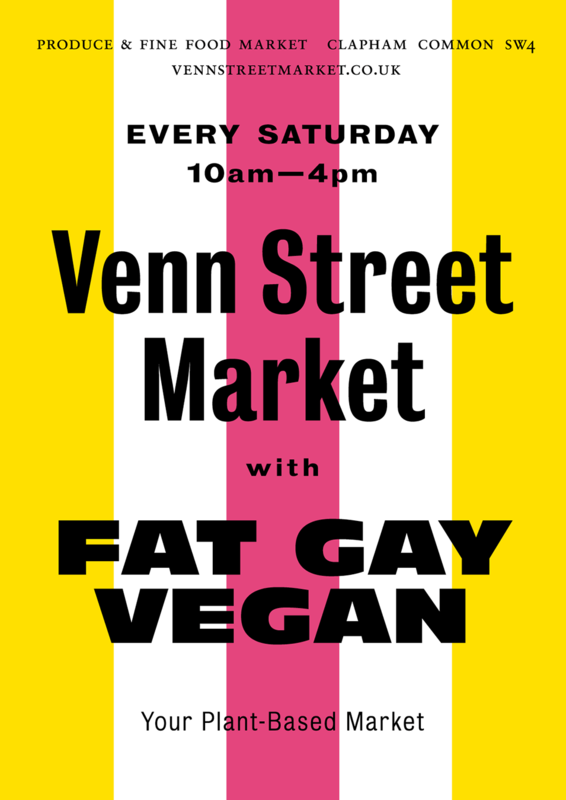 Fat Gay Vegan at Venn Street – Saturday 10am-4pm (RSVP on Facebook). Next up we have the Fat Gay Vegan section at Walthamstow Sunday Social every Sunday. Local traders join forces with some from further afield to bring you a powerhouse vegan section at this HUGE street market between 10am and 4pm every Sunday on Walthamstow High Street. RSVP on Facebook. The vegan section of Sunday Social is located on the High Street near Erskine Road. See the location thanks to Google Maps. Regular traders include The Green Grill, The Nooch, Red Tent Ethiopian, Horia Vegan, Tastopia, Horia Vegan, and Bar de Baci. Please note that line up is subject to change so don’t be super sad if you show up and your favourite couldn’t make it along. Follow FGV on Instagram to get latest updates.